For the past 26 years, Cambridge Energy Research Associates (CERA) has hosted an annual CERAWeek conference in Houston that is renowned for high-profile attendees from around the world. During the week of March 8, security was tight as oil ministers from the Middle East and CEOs from the largest oil and gas companies and electric utilities rolled into Houston to exchange ideas and forecasts. More than 1,200 delegates from 55 countries attended to hear more than 100 distinguished speakers discuss a business that seems to have renewed optimism about the future. The first three days of the conference were focused on worldwide supply and demand issues for oil and natural gas. Days four and five of the five-day conference were dedicated to electric power. Those days began with a discussion between Daniel Yergin, Pulitzer Prize – winning author of The Prize: the Epic Quest for Oil, Money and Power and chairman of IHS-Cambridge Energy Research Associates, which hosts the conference, and Nobuo Tanaka, executive director of the International Energy Agency. The focus of the keynote discussion was Asia’s rebound from the global economic crisis in general, although China was the main focus. Unlike the U.S. and Western Europe, where demand for electricity is flat at best, China seems to be experiencing the strongest recovery from the worldwide economic downturn. 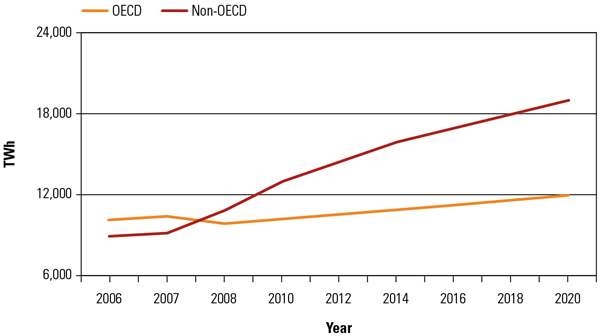 China is now projecting a gross national product growth of 10% for 2010 with growth in electrical consumption of 10% during 2010 and 8% in 2011. During 2009, China ordered 45,000 MW of new steam turbine generation equipment, about 50% of all orders worldwide. Of these orders, approximately 26,000 MW were for coal-fired units and 16,000 MW for nuclear plants. China is also working diligently to ensure its future coal supplies. In February of this year, China signed a 20-year, $60 billion take-or-pay contract for 300 million tons/year of coal from Australia. Today, China produces about 75% of its electricity from coal, and the terms of this contract made it clear that coal will remain China’s favorite fuel for many years to come. In contrast, GE Power & Water president and CEO Steve Bolze presented his projections: Approximately 2,700 GW of power generation investment will occur worldwide in the coming decade, with coal plants still getting about a third of each investment dollar (Figure 1). 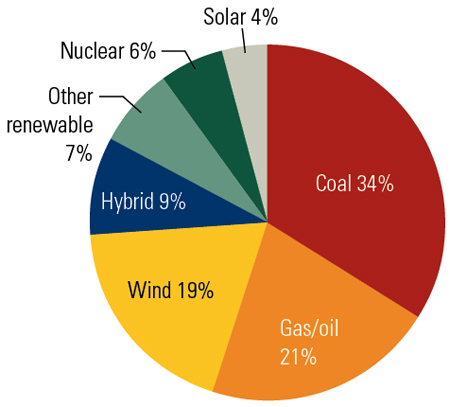 China added 12 GW of wind generation to its grid during 2009, more than any other country. By comparison, the U.S. added 10 GW of wind in 2009, making a solid claim for second place in the wind race. Another interesting statistic: In 2009 more automobiles were delivered to Chinese customers than to U.S. customers. Only a few years ago, a number of economists were ridiculed for predicting that China would surpass the U.S. in automobile purchases within 10 years. Now, all power generation products and products that consume electricity, even electric cars, are being tailored for the Chinese market. We are witnessing the evolution of a Chinese middle class that desires automobiles, better housing, appliances, and creature comforts. Taken together, the world should expect a rapid increase in the per capita consumption of electricity in China (Figure 2). Edison International CEO Ted Craver noted that Southern California retail sales of electricity fell 10% during 2009. He sees the market stabilizing in 2010 but predicts, "It will be 2016 before we sell the same amount of electricity as we sold during 2008." The industrial segment of the electricity market in California now only represents 10% of electricity consumption. 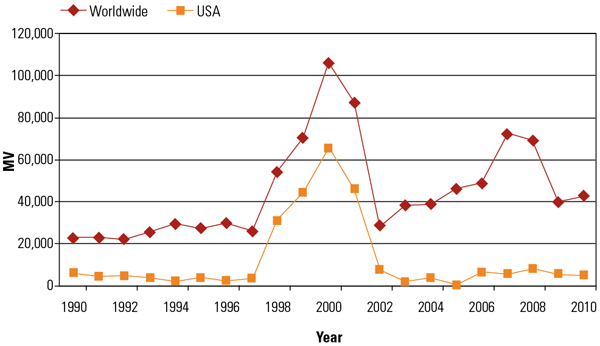 In 1990 industrial consumption was about 20% of the California market. What part of this reduced industrial consumption is due to businesses fleeing California for states that are more business-friendly, with lower electricity rates, and what is due to the general economic malaise was not discussed. Peter Darby, CEO of Pacific Gas & Electric (PG&E), sees demand for distributed generation accelerating. "Our customers want solar generation of electricity." This sentiment is echoed by California Governor Arnold Schwarzenegger, who, by a September 2009 executive order, required electric companies to supply 33% of electricity sold in California from renewable resources by 2020. Because it is too difficult to predict how fast the solar generation segment will evolve, PG&E wants to be on both sides of the market — that is, building solar central station generating plants on the supply side and also making investments in smaller rooftop installations to reduce demand. If customers install their own solar generation, that means less demand for electricity that PG&E must generate. Mike Morris, CEO of American Electric Power Co., said industrial power consumption was off 15% for 2009 versus 2008. Overall electricity consumption was off 6%. Morris projects that 2010 overall electricity consumption for AEP customers will be flat, or perhaps up 1% at best. David Ratcliffe, CEO of Southern Company (parent of Georgia Power, Mississippi Power & Light, Alabama Power, and Gulf Power), addressed the situation in the Southeast. Ratcliffe said that sales overall were down 6% for 2009 versus 2008. "We think we’ve reached the bottom," he said. Ratcliffe is projecting 1.5% to 2.0% overall growth for 2010 in his service territory. One clear theme was prevalent during the CEO discussions about recent electricity production statistics. Each utility was beginning to recover from some amount of "demand destruction" over the past two years that far exceeds any similar downturn in electricity purchases in U.S. history. Prior to 2008, Americans consumed more electricity every year since 1900 with only a few exceptions. These exceptional years (1974, 1982, 2001, 2008, and 2009) coincided with economic recessions. 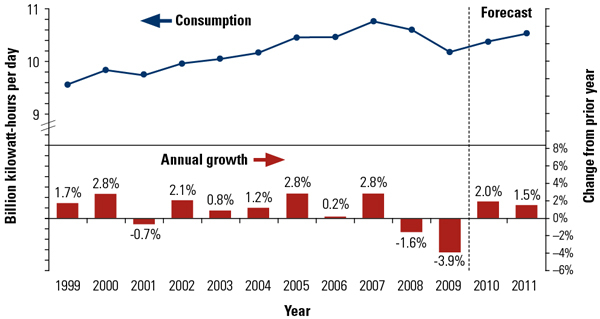 However, the two-year period of 2008 to 2009 was the first time U.S. electricity consumption declined for two consecutive years (Figure 3). Another discussion point: While the Department of Energy is now forecasting an increase in electricity consumption for 2010, there was no consensus about whether this growth will actually materialize. Orders for gas turbine and steam turbine power generation equipment fell sharply in 2009. For example, global orders for turbomachinery fell 45% year over year in 2009, and only a small bump of a recovery is expected in 2010. In the U.S., business dropped about 25% over the same period (Figure 4). GE’s Bolze described the combustion turbine market as "stabilizing." He went on to say, "The fourth quarter of 2009 was up a bit, but we expect the recovery in orders to appear first in regions outside of North America." The big question raised at CERAWeek about the combustion turbine market: Are we now setting up for another orders "boom" in 2011 or 2012, given the predicted volumes of natural gas that will soon come to market? Since 1998 there have been two boom-bust cycles, but no one was ready to predict another boom cycle coming. History teaches us that the combustion turbine market has never been stable enough to make such predictions.